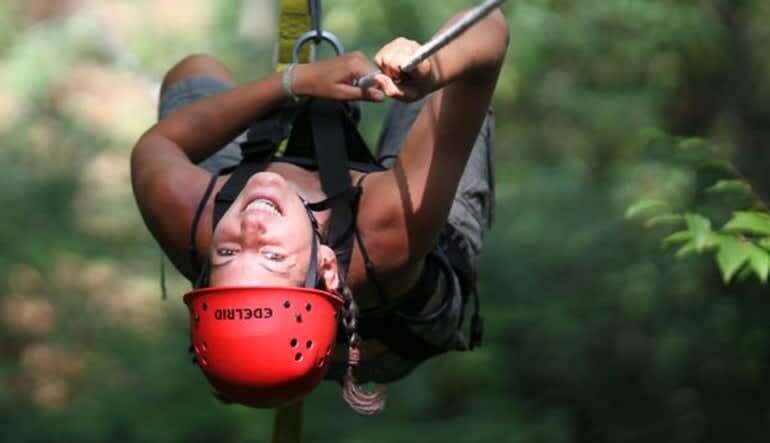 Zip through the backwoods of New River Gorge side by side with a friend from 9 different platforms. 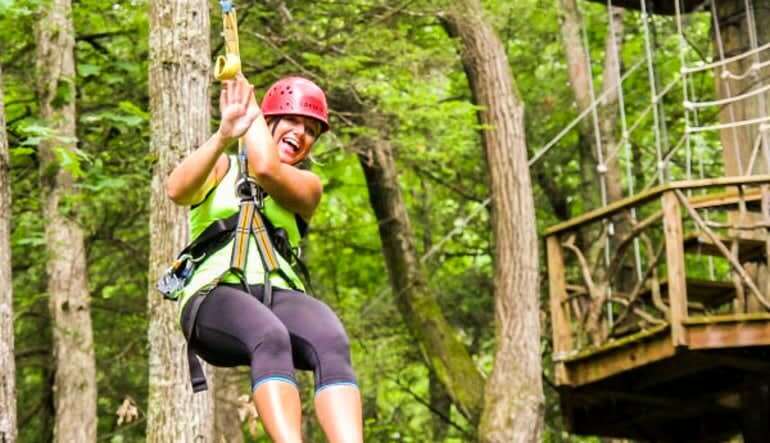 Zip through New River Gorge on a network of 9 zip lines and two suspended bridges spanning over 1 mile of cliff line. Each zip offers unique views and exciting speeds. Several of the zip lines feature dual lines so you can race a friend to the finish or cruise slowly together and enjoy the views. Zip 1: 490ft long zip through the trees, beginning on the edge of New River Gorge. Zip 2: 380ft long zip that boasts spectacular mountain and river views. 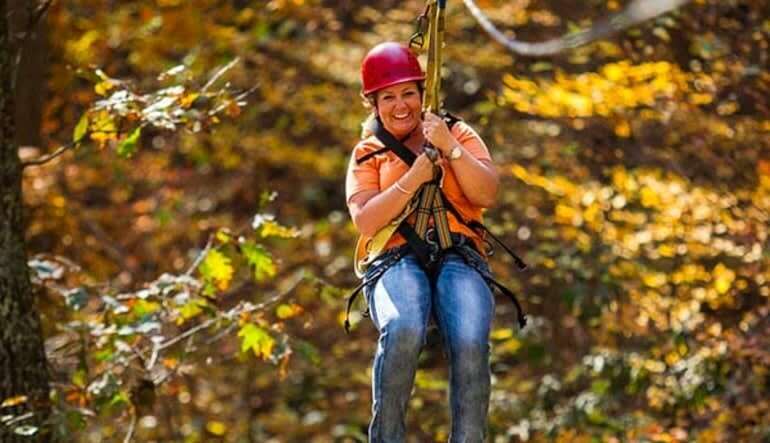 Zip 3: 680ft long and 100ft high zip, Reach speeds up to 40mph above the tree line. Zip 4: 200ft long and 40ft high offers serene views of Rush Run Canyon and the Gorge. Zip 5: 200ft long zip and 60ft high with amazing views from White Wall to unique rock formations. Zip 6: Race a friend side by side for 270ft to the finish line or zip backwards if you are up for an extra rush. Zip 7: 525ft blind zip that you can't see the end of, designed for speed and thrills. Zip 8: 800ft long and 120ft high stretches across Rush Run Canyon, the biggest of all the zips. Zip 9: The final zip of the day will have you dropping off the edge of the deck and free falling for 45 feet before landing safely to the ground. All of this heart pumping action will make for an adventure thrill day your family will remember for a long time to come. Was absolutely amazing!Me andmy Husband had a wonderful time .Tour guilds was on point fun and absolutely awsome talked me threw everything .will be back next year!! Our guides were Jenna and Danni. Wow! They were great! I was reluctant on the first zip and both ladies were patient and encouraging. They convinced me I really could do it. And I did. Then on the last zip, when I really, really was super hesitant, Jenna stayed with me and, once again, had great patience and convinced me I could do it. And I did! I thanked them both and told them they saved me from being a wimp! I would recommend the zipline adventure to everybody! 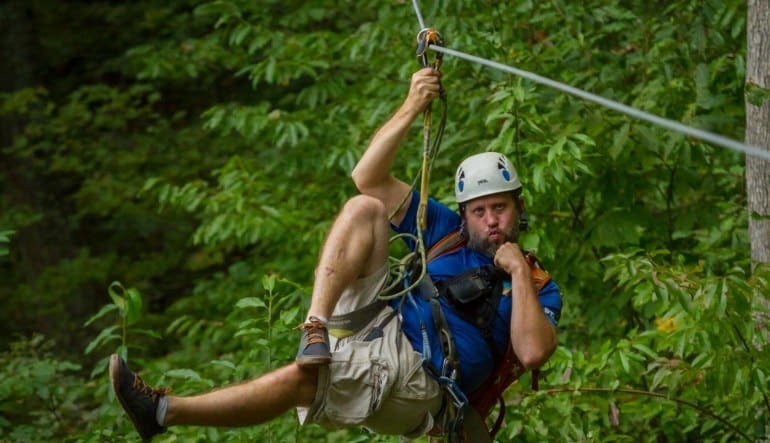 I am telling friends already, "Don't let another year go by without having the zipline experience!" Great trip and great guides. Dana and Jenna gave us a really great experience. It was better than I expected. My son and I had one of our best days together. Well worth the drive from NC. Our guides, Jenna & Dani, we excellent! My son and I had a GREAT time!!! Minimum weight of 70lbs. - Max weight of 250lbs. Tours depart at 9:30 AM and 1:15 PM. 8:00 AM departures are available in Summer.